So, I was introduced to the idea of kale chips by my friend Lori, and she easily converted our friend Cyndy into a true believer…but somehow I’d never gotten around to kale chips. Then, the one time I tried them recently (with CSA kale), I managed to flub it. I was so excited about making the kale chips and jumping on this bandwagon that I didn’t really question whether I was putting too much on the tray. Turns out, I had put too much on. I didn’t realize at the time that kale chips need to be in a single layer to crisp effectively. When you have kale piled on top of kale (even just one extra layer), you can have limp kale instead of crackling, crunchy kale. It’s a critical difference. Shot #2 at kale chips came when the week 5 CSA delivered into my hot little hands a bunch of purple kale. Ooh baby. Purple is one of my favorite colors, and when you put that together with a leafy green (leafy purple? ), I just think that’s magic. As dh noted, “Purple IS a color found in nature!” So it is. I used the same amount of kale, but this time I divided it between two pans. That certainly made all of the difference, both in texture and in acceptance (everyone in the family eagerly dug in). 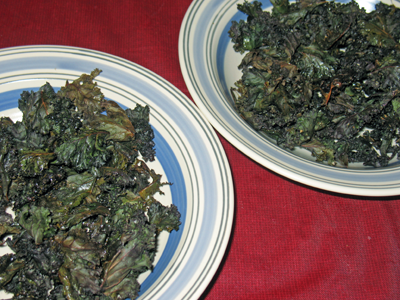 Thus, we have Cyndy’s recipe for kale chips with a slight set of mods. As I’d noted previously, I put Penzeys 4S seasoning on the regular kale chips (and the ones that came out crunchy were very tasty). Today, I did two pans – one with the 4S and one with a light sprinkling of salt and a very light dusting of ground white pepper. YES. This worked. Where the white pepper took hold, the kale had not only the green flavor of the kale but also the nice bite from the pepper that gave it a little kick. So nice, I made 'em twice! 2. Wash and dry the kale, then tear the leaves into small pieces. 3. Place the kale on baking sheets in a single layer. This is VERY important. If you have enough kale that you have to stack it in anything more than one layer, employ an additional sheet. The pieces can be touching (horizontally), but they should not be stacked. 4. Drizzle olive oil lightly over the kale, then toss with tongs to coat the kale with the oil. 5. Lightly sprinkle your seasoning of choice over top of the kale, then place the baking sheets in the oven. Cook for 10-13 mins. 6. You can tell the kale is done when you lightly touch the tops of some pieces and they make a light crunching sound. If there’s softness or give, then you need to leave it in longer. This entry was posted in locavore, side dishes and tagged CSA, eat local, locavore, vegan, vegetables, vegetarian by crunchymetromom. Bookmark the permalink.